It all started on a Friday, one of the coldest nights in the year. The next 36 hours would be a blur of emotions. Here I was, 40 weeks and 6 days pregnant, the day of my induction. My little squishy apparently had no plans of joining us anytime time soon. I had 3 sweeps done, and I had not even dropped. So early afternoon I had a gel inserted to help jump start his evacuation...his rent had come due, haha. The whole induction process went well. We were told to go home, relax, and come back about 6 hours later so they could see if I had started to dilate or if they would have to repeat the process with the gel. When we got home, we had some dinner and I felt some mild cramping but nothing I had not already been feeling for about 20 weeks, so I decided to go and take a nap. Well, I could not sleep for the life of me. I was way to pumped to meet my little man. A few hours after my induction I started to feel tightening, so exciting! My hubby and I started to time my contractions, and about an hour before we went to the hospital my contractions were about 5 minutes apart...go time! At this point I am not going to lie...I started to feel sick with nervousness. I knew I was having a baby for 9 months, but when I knew I would be meeting my little squish any time, it all become very real. Even though I was having contractions I was worried that I would not be dilated enough and they would send me home...I was expecting that to be honest. Well, the doctor checked me out and all I remember hearing is "2 cm...lets break this water". I was shocked, and ecstatic. Finally! It was all happening. When she unpacked what I could only describe as a GIANT crochet hook I got nervous. That was painless really, and was over quickly. We were told I could walk around to try and jump start the dilation process, so we walked. I could only do a few laps of the ward because my contractions came on HARD. It is hard to describe the pain. It pretty much felt like the little bowling ball I was carrying was trying to fall out. After a few hours my doctor gave me morphine for the pain because I could not et my epidural for a little while yet. At that time I felt like Morphine was a big lie. I was still in pain, I was just slurring my words. Epidural came around, which was a BREEZE. It did not hurt me at all, but it took a long time to kick in, and later come to find out the baby was in a position which can cause extreme back labour. Eventually the pain went away...thank the lord for epidurals. It is about 10pm and was told just get some sleep....right. I tried, did not happen. They came in to check me periodically and I was making progress. 8 am rolls around after a long sleepless night. I was nauseous and throwing up due to the pain medication, and then they tell me that I was stuck at 6cm. I had been at 6 since 4 am and had not progressed further. They told me that they could let me keep laboring, but baby was starting to get a bit of a cone head trying to come down, and I started to get a mild fever, so it was in my best interest to get a C-section. I was devastated. Logically I knew it was okay, it happens, but I felt in that moment that my body had failed me. We had trouble to get pregnant, and now my body can not even push out a baby. Why was my body fighting me constantly? I felt like I could not do what came naturally to everyone else. In that moment I felt scared and alone, even surrounded by people. They told me they were booking the O.R and that my hubby could come in once I was prepped. No time at all they were wheeling me down, not even 2 hours later. The whole process was very quick. I remember feeling so scared and cold as they took me in the operating room. The room was bright, sterile and cold. They started the spinal block and poked me and said "can you feel this" and I said no...until the last time they asked me. I felt them poke me with something shard on the left side of my belly. We waited a few more minutes and they check again...I could still feel it. They then said this sometimes happens and they were putting me under general anesthetic, so I would be asleep. ASLEEP for the birth of my child! I asked if my husband would still be able to come in, and they said no. I broke down into tears. Not only had my body robbed me of being able to witness my child being born, my body robbed the chance from my husband too, that made me feel terrible. The nurses tried to be comforting, but nothing made me feel better, I just wanted my husband and my baby. They told me to count back from 100...I made it to 98. I woke up in recovery. I opened my eyes, confused, I completely forgot for a moment where I was and why I was there...Then I heard a cry. Its hard to explain that moment when you first hear your baby cry. By the time I woke up, the baby had already been check over, had his tests and ate. I missed it all. I cried. Of course I was so happy and thankful our baby boy was here and healthy, but I felt robbed. I always dreamed of the moment you delivery your baby and they put them on your chest and they are one of the first people they see. That did not happen for me. I missed the first few hours of his life. I was never going to get that back. In that moment I felt like a terrible mom. It still plagues me to this day. The rest of the time at the hospital was standard. I was not in too much pain thanks to trusty old painkillers. When we got home though, I needed lots of help due to the caesarian. I could barely lift my baby, I couldn't even walk standing up right. It was all very emotional. I felt like a horrible mom, and was worried he would resent me. Eventually I came to realize, he does not know what happened. I came to realize I tried! I tried to stick to my birth plan, but I couldn't. I tried to do everything for him when we came home, but I couldn't. That's okay! As mothers, we are so quick to judge and shame other moms. "Oh well I gave birth with no meds" or "I was able to push out the baby", or even "I was able to breastfeed exclusively for a year". Who are we to judge what works and what doesn't work for another mom. We are still moms! No matter how you gave birth you are a mom. You expelled that child from your body...good for you! C-sections are not easy and recovery is usually a lot worse than having your baby naturally. My point is, try not to doubt yourself, and don't beat yourself up. You cannot control everything, believe me, I tried. All that matters in the end is that you have your happy healthy baby in your arms. Cherish it. This story brought back so many memories of my own child's birth. I also had a failed induction resulting in an emergency c section. I remember the moment that wonderful epidural kicked in. 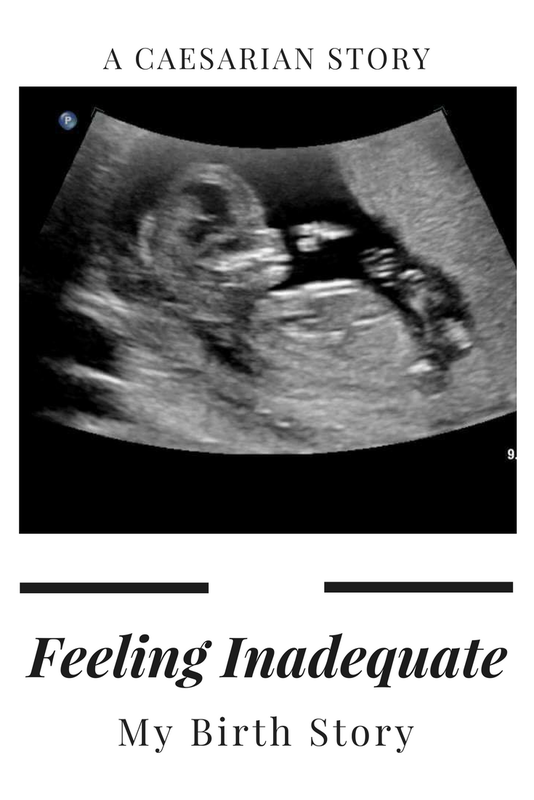 I remember rationally discussing the options with my OB, and I remember that moment of feeling my body had failed me. Such irrational thinking. There is nothing wrong with having a c section in my opinion. But that feeling must be primal and universal. Thank you for sharing your story. All you can do is be the best mom you can be for YOUR kiddo and not anybody else's. There is not a right and a wrong way to parent, a manual, or a step-by-step tutorial. It's a custom deal for every single person. You are enough for your little one! Love reading your story. Having a plan is always great, but I think people forget that sometimes it just doesn't work out the way we want it to and that is ok! You are so right though the ONLY important thing at the end of the day is that everyone is healthy and happy. Its not fair to be hard on yourself. I went through all these emotions as well when I ended up having a c-section. But in the end when I can workout and sneeze without peeing myself, but my friends who gave natural birth can't, I realize a c-section has it's perks! Not to mention, we are not "stretched." You go mama!! I also felt like I “failed” as a mom when I had my c sections with both kids and was barely lucid with my second. Thanks for sharing this! You’re an amazing mama!! Thank you so much. It still eats at me but there is literally nothing I can do to change how it went so I learn to be happy with it. My PPD is triggered because of my traumatic birth story. I actually wrote it in my blog as well. It's hard to feel that you are a good mom when guilt is eating you up. You are right that we can't control everything and that's really what I want to sink in. Your right it is so hard! I hate giving up control, lol. Thanks for the read. Absolutely Stacey! We mom's in knowing make things difficult for ourself. A healthy baby and a healthy mom are the only outcome that matter. WOW! I didn’t know that general anesthetia was an option for having a baby! I always said my only birth plan was to get the baby here safely and me to remain safe in the process. THAT is the only goal and you achieved it! Thanks for sharing your story. Oh my, this was the sweetest, most honest story. I didn't even have a birth plan. I know a ton of people who got c sections and it was more of a challenge for them to take care of their babies afterwards than it is for those who were able to push their babies out and they still did. So I give you props. It doesn't matter how that baby got here, what matters is that they are here. Good job Mama. This was a beautiful story and I enjoyed reading it. I completely understand how you felt and know SO many women that have had to have c-sections after going through labor. I also know someone that has had to deliver a stillborn. I'm sorry you didn't get to witness the birth of your baby, but you are still a hero and the absolute most important part is that you and your baby are here, alive, and together. You did it and I'm thankful for medical staff that allowed that to be a reality, rather than something worse. Good job mama! Your so right! I am thankful everyday that everything turned out! It’s amazing how diverse our birth stories can be! It seems the births never turn out as planned. Before becoming a mother it was never something I thought about! My daughter was breech for a majority of my pregnancy so I had a scheduled c-section. No matter how you birthed your baby you are a strong mama and your baby loves you! You're probably even stronger now that you had to go through that C-section recovery while taking care of an infant! I'm in my final trimester with my first baby so I guess I don't know much and I have no idea if the delivery will go as planned for me but we all carried our babies around for nine months and no matter how we deliver our babies or if we choose to breastfeed or not we're still their mamas. I'm sorry you had to miss out on those first moments with him... but he will never know and just think, you have the rest of your life to spend precious moments together! During the birth of my son my hubby kept saying “mama okay, baby okay”. That’s all that matters! Happy Mother’s Day! it really is all that matters! I am so sorry that you and your husband did not get to experience birthing like most parents do. Even with my c section, I was awake and my husband was allowed to be in the room with me. For a while, I felt some type of way about not being able to give birth naturally. But that passed because I am more grateful everyday for my beautiful blessing that calls me mom. During pregnancy I was attending to the birth school (where I met great girls in fact). I was taught plenty of methods to relieve yourself during delivery, how to breastfeed and take care of a newborn properly... When this moment in hospital came, I forgot everything. I became completely stupid. But I've managed! Thank you for sharing your empowering story and insights! I remember creating a birth plan with my first and nothing went as I had planned. In time, I accepted it but I think it's so very important to let ourselves acknowledge our feelings like you did. Well done Mama! I have had 4 children and not one birth plan go right. Thanks for sharing your story, I look forward to reading more.